Here I am in a tent hidden away among a sea of thousands of other tents in the muddy roads of the Domiz Refugee camp. I sit here looking around, knowing in this tent under the thunders of winter nights with a little lantern scripts are written to the most emotional theatrical performances you will ever watch. Under this tent, hours past midnight friends laugh away as they do provas for their performances and it is under this tent a pregnant young actress spends her nights tossing and turning and soon, where her newborn will cry away into sunrise. Love. That’s the only caption I can think of. I was looking back at one of my old note books to find dot points of an interview I did a long time back with a couple who are using the most difficult days of their lives to send messages to others, to make people smile and to highlight issues that they face as refugees. Sozdar, 25 and Rozhman, 22, we neighbors in Syria then became lovers for many years. After Sozdar’s escape Rozhman followed him to the Kurdistan Region, and got married on the other side of the border, both as refugees living in a refugee camp. While life became tougher than ever before, they survive each day practicing their profession and hobby as actors and in Sozdar’s case an actor, director and script writer. Me, with Rozhman, 22, actress, in her tent at the Domiz Refugee camps. Here, she shows me memories of her refugee wedding! There is no doubt for their young age this young couple are dealing with a lot of stress and everyday life dilemmas that no one wishes to face. Although, they manage… somehow. I found them to be an inspiration. “I write all the plays’ scripts after 12 midnight, because there is always something going on during the day, I can’t think properly.” As Sozdar tells me this an elderly lady invites herself into their tent, “Hi, I didn’t get the gas,” she says, Sozdar, also happens to be a mukhtar for the area he lives in within the camp. About 500 people give their complaints to him to give to the camp authority. The couple have studied performing arts in an institute in Syria. Though their life and the experiences they have endured are way beyond their years. Sozdar’s siblings, five sisters and two brothers, are in a refugee camp in Lebanon while his elderly parents remain in Syria. “Since I was 15 years old my dream has always been to spend 10 days in a row with my family.” He says, I hold back tears, feeling the pain of a 25 year old who has probably experienced hardships in his life worth three times his age. I remember when I first watched their performances about marriage in the camp I cried and laughed my eyes out at the same time. I don’t know how such a tragic, real story can be portrayed and the messages strongly sent to the viewer while at the same time making you laugh. I even remember they had the sound tracks on one of the actor’s mobile phone. With so little, they manage to do performances that are so big in both meaning and quality. Although now the UNFPA’s youth friendly Space in the Domiz Camp has provided them with their necessary equipment to conduct their peromfnaces inside the camp. The early days of Rozhman’s pregnancy… now she is a mother to a baby girl. 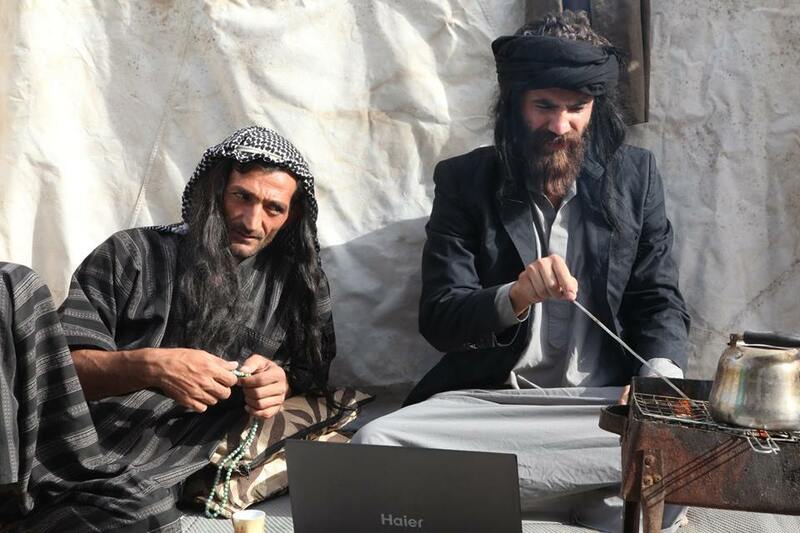 As for Sozdar, he wants to stay in the camp, experience the pain and share the sorrow of others, help when he can and tell people’s stories of hardship through the writing of his scripts and the acting he does. “I don’t have a passport and no ID what so ever, nothing. I am not a citizen of any country. No country recognizes me. I only feel Kurdish. Nothing else.” Sozdar says referring to his life before the events in Syria, where he was not granted citizenship because of his Kurdish background. The story of Sozdar and Rozhman remind me of how difficult encounters in life can be used to give positivity to others and despite all hardships one can still make small dreams come true and be of good use in their community. I remember once as part of a project we worked on we invited them to do a performance in Erbil. “I had a shower a hundred times in the hotel room,” Said Sozdar as a joke, being grateful for spending the night in a place where he didn’t have to bend his head down before entering into the ‘room’ and having hot water coming out from a shower head. “Feels like I have never had a proper shower,” we all laughed, but I knew too well the couple probably felt like they were on honeymoon right now. A scene from the play wedding night at a refugee camp. This visit took place earlier in the year in one of my visits to Domiz, things might have changed now. I don’t know of much developments as I was in my own world welcoming my own newborn, but I do know since then Rozhman gave birth to a little girl, Rozha Peshmerga (day of the Peshmerga) if I am not mistaken! And the couple continue to do performances, planting smiles on many faces while tackling important issues faced in their and our society. If you would like to contact Sozdar or invite him and his little group for a performance you can contact him through Facebook here.